When you feel that one of your child’s teachers has gone the extra mile and been particularly supportive of your child, whether emotionally or academically, it is worth getting in touch to express your gratitude. A teacher might have helped your child through the loss of a grandparent, for example, or encouraged them to read widely. They might have supported your child during a period of bullying, perhaps, or set up a new sports club due to student demand. By getting in touch and saying thank you, you will be rewarding your child’s teacher for their added hard work. Many teachers feel particularly motivated when they know that their personal actions, imaginative plans or sheer hard work have made a real difference to the lives of the children they teach. 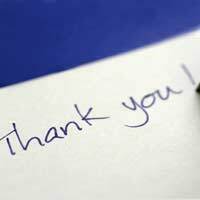 When it comes to saying thank you, there is no better medium than the old fashioned letter. Your child’s teacher will be able to keep your thank you note as an inspirational memento. It may even spur them on to support other children in the future too.Below is an example of a thank you letter that you could send to a teacher who has been particularly supportive of your child. I just wanted to get in touch to say a big thank you for all your support over the past few months. My husband and I don’t know what we would have done without you. When Sarah lost her grandfather, I was really worried about how she would cope. You’ve been so kind and sympathetic and I really appreciate the way in which you have looked out for her so constantly. When Sarah is upset, she usually retreats into herself and it can be a struggle to encourage her to get up and ready for school. In creating such a welcoming classroom atmosphere, however, you’ve managed to change that. Sarah tells me how open you are to hearing any problems your pupils might have and how generous you are with your time. I can’t thank you enough for giving up your whole lunch time to talk to Sarah that first day and for carefully ensuring that all her other teachers knew about her grandfather’s death. As well as helping Sarah through a tough time, I truly believe that your support and warmth has increased her confidence. Sarah was previously slightly shy around adults and did not like to discuss her problems with my husband and I. She now feels more comfortable talking about emotional issues at home. She misses her grandfather very much but is able to speak about her happy memories of him in a brave and mature manner. Thank you, again. Sarah and her classmates are so lucky to have you as a form tutor and you really are a true asset to The School House.